The UK Parliament’s Work and Pensions Committee have opened an inquiry into PIP and ESA Assessments. They are currently accepting written submissions, the deadline for which is Friday 10th November 2017. 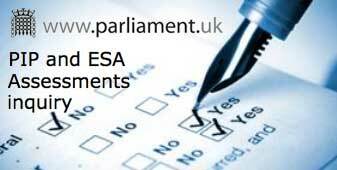 The Committee invites evidence on the effectiveness of assessment processes used to determine eligibility for Personal Independence Payments (PIP) and Employment and Support Allowance (ESA). The Committee is interested in receiving recommendations for change both on the assessment process for each benefit individually, and on common lessons that can be learned from the two processes. If you have had an assessment, or are waiting for an assessment, for PIP or ESA, The Committee would like to hear from you.